We both woke at 6am, which was far nicer than being dragged awake by the alarm that was set for 7am. We had no choice but to walk the dirt road and be brave enough to use one of the two ATMs that were around in ‘the village’. We needed cash and they were the only choice without paying 600 Baht for a taxi to somewhere more civilised – and still use an ATM there. I didn’t really take any photos of ‘the village’ and it’s hard to describe without being rude, which I don’t wish to do, because the people were beautiful, friendly and kind. So where does that leave me? And you? Their lives were simple. There was always the incongruity of small, ramshackle, wooden dwellings while the occupants played with iPads and talked on mobile phones. The rough wooden shelters that the taxi drivers all waited in were often equipped with TVs, yet had no other comforts at all. Just some wooden supports holding a few wooden benches for them to sit on, and a wooden roof. So the thought of using an ATM seemed like a dangerous pastime – would it even work? What on earth would we have to go through if not? There was a choice of two and we decided on the one attached to a still-closed money exchange. Holding our breath, David put the card in. The first relief was that the screen showed English as well as Thai writing. The second relief was that it all worked as planned and we got both our money, and our card back. Phew! Thankfully, it cleared after about 10 minutes and disappeared as fast as it had arrived. It was, after all, monsoon season. We knew this before we went. Downstairs, and we were assured by the little restaurant that our requested packed breakfast was ‘almost cooked’. Interesting. We’d asked for a ham and cheese sandwich and a cheese sandwich. Cooked??? When we’d requested these the night before we’d been offered additional French fries – really? For breakfast? And cans of Coke, which we’d politely refused. But the sandwiches arrived and it turned out they were toasted club sandwiches, and were very nice indeed. I only ate half of mine and saved the rest for later. By now it was 1½ hours until we sailed so I had to take my travel sickness medication. The bus was a little late picking us up, but the driver was friendly, as were the other Aussies already aboard, and the drive was pleasant, taking about 30 minutes. When we got out of the bus we were each given a sticker to wear and told we could get coffee or tea inside a café/gift shop. I aimed for the loo, quick, before too much of a queue could develop and I’d be dragged away without emptying my tank. I needn’t have worried – 1 girl took up camp inside there and we had to resort to finding another toilet altogether! Eventually we were back in the café and I said to David “Are you having a coffee?” And he, only speaking Male, not Female, said “No thanks!” So he was given a bit of a ‘look’, realised his mistake, and hurried off to get me a cup of tea – tee hee!!! I hadn’t had a single sip when we were hurried along to walk to the pier. I carried the paper cup carefully so as not to spill the liquid I was so desperate to drink. The travel meds dry your mouth out like a sandpit on a hot day, but I couldn’t stop to sip, as the walk was hurried, and a surprisingly long way!!! We were half way along by the time David took this shot. 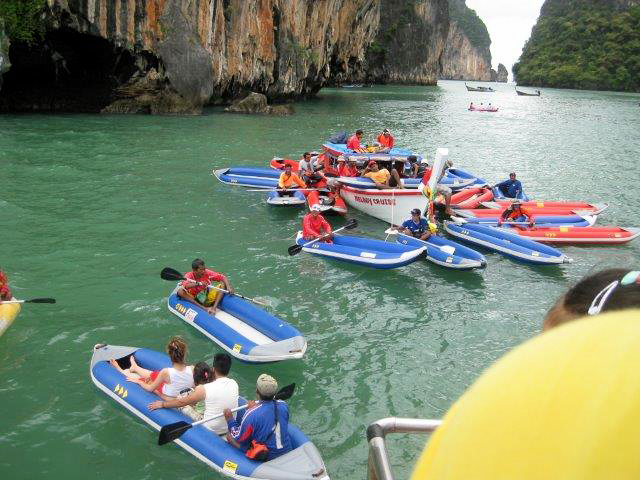 We were all herded onto one of two boats. It was absolutely crammed full and I walked along trying to find a single inch of seat to perch our rear ends on and be together! We found a tiny corner, right at the front of the passenger area, squeezed behind a metal bulkhead with no hope of seeing where we were going. 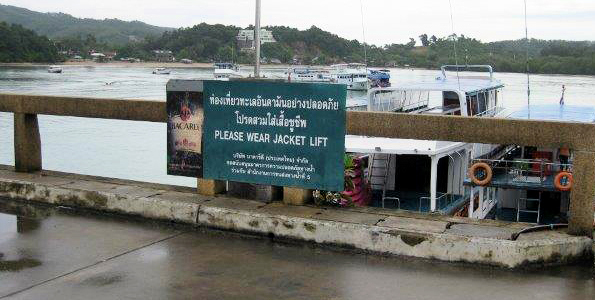 I guess this means ‘life jacket’. An additional feature to the over-crowded conditions was that we were right next to a massive speaker that the guide was using and it was absolutely deafening. We couldn’t even understand a word she was saying because we appeared to be the only people aboard who were not Chinese. I said hello in Chinese to the people next to me and they seemed surprised and happy and replied the same. I often say that a good day is one where I get to speak more than 1 language and I managed 4 on this day, English, Thai, Chinese and German. Here was our *only* choice of view from our tiny corner perches. 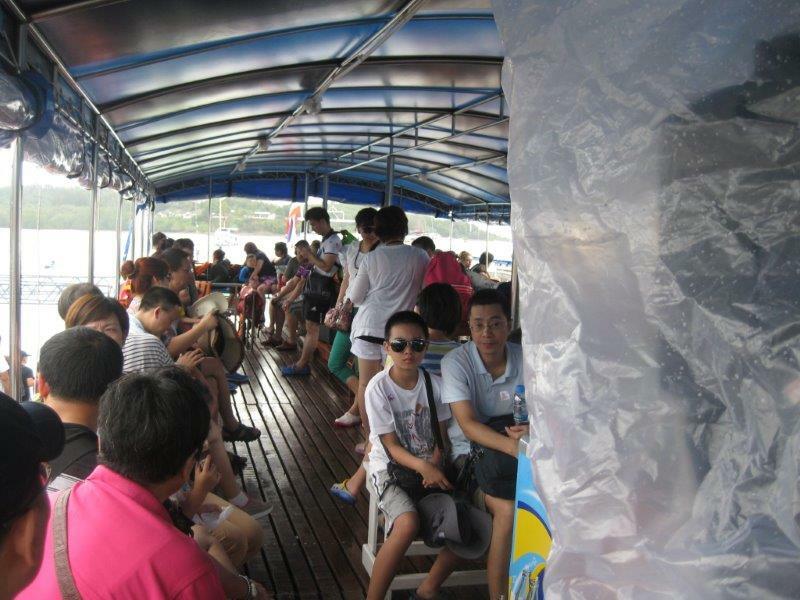 To the left was a high metal side to the boat and behind was the wall between the passengers and captain’s cabin. I felt so bitterly disappointed! 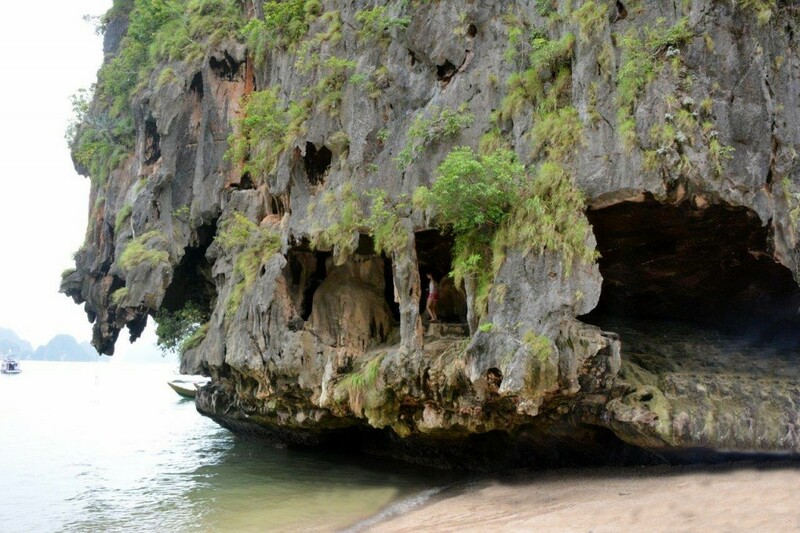 Then, amidst the words that the guide was saying I heard her say ‘Monkey Island’. What??? Oh no, please don’t tell me we’re on the wrong cruise!!! What else can go wrong? After she’d finished speaking – and it was a very long time – I went over to ask about Monkey Island. It was far too late to fix because we’d cast off before she’d said it. 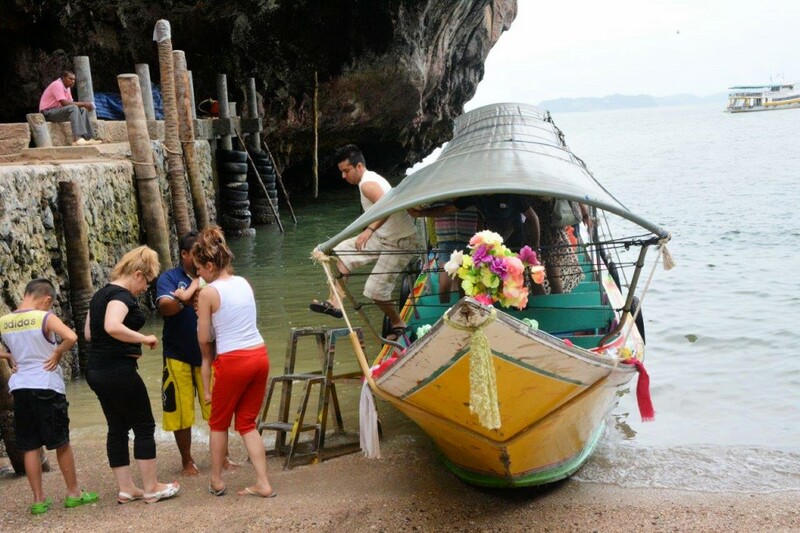 Her Thai side kick laughed and assured me in a really friendly and kind way that we were not going to Monkey Island. Whether I’d misheard her or not I don’t know. I didn’t care – at least we were on the right boat! The guide was Thai too, but obviously of Chinese heritage. The 2 of them were gorgeous! I forget why, but David went downstairs and came back very excited to report that it was almost empty down there! Trust me, we left a dust trail behind us to get there!!! Downstairs were tables and chairs, only about a quarter of the tables had anyone sitting at them, and it seemed to be the Australian and European section of the boat. Most odd! To get to the open air front of the boat we had to walk along a really narrow section with a flimsy and too-low railing. Thank goodness I was not responsible for children on this trip or I’d have freaked out. Yet I saw children of as little as about 8 years old walking along here with no adult in sight! The air was full of moisture and although we could see the many islands quite well, the camera picked up the moisture and would only produce misty photos. It was such a disappointment. I’d got my photos from last year and had hoped to improve on them this year, but it was never going to happen. 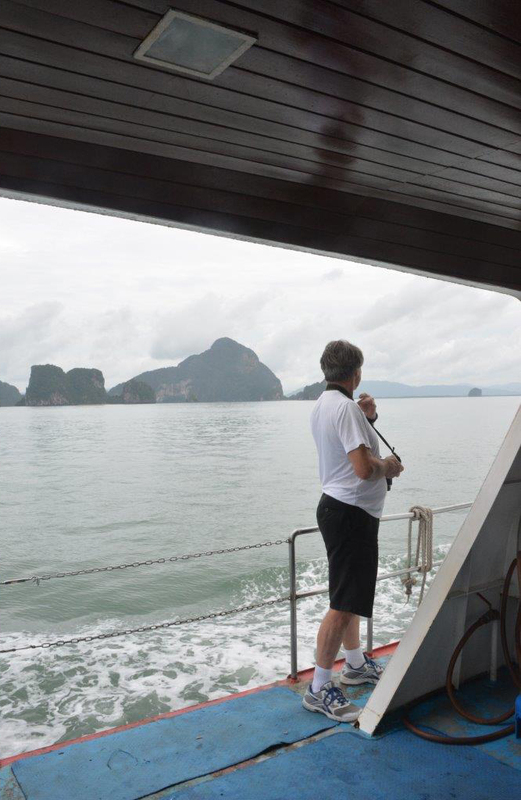 Our first stop was James Bond Island and some long boats with absolutely massive engines were brought out to our boat to transfer us to shore. It was pretty push-and-shove so David and I patiently waited until we could get into one of these without being knocked into the water. At the far end they thankfully had a little set of stairs for us to step onto. Though the frozen posture of the guy in the photo does make me laugh! 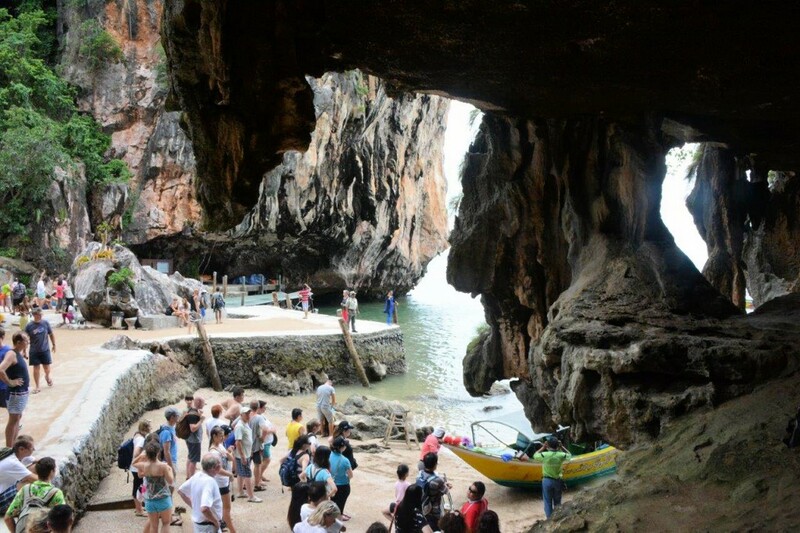 James Bond Island would have to be one of the strangest places! It’s basically 2 gargantuan tall rocks with a flat beach between them, and the beach has sea on the front and back of it. 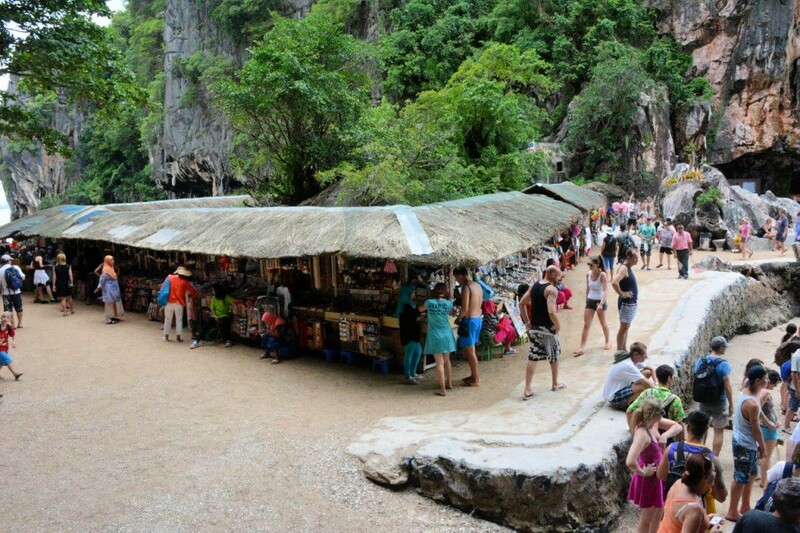 The beach is covered by a square with market stalls facing outwards on all 4 sides… and 12 million tourists. The rocks themselves were truly fascinating and, if you were steady on your feet you could clamber inside one of them. Hopefully you can see the girl walking along inside the centre ‘window’. We clambered up and here’s David doing the crouched walk required in parts of it and disappearing from my view. I followed along until the floor was sloping and wet. I was going no further and called out to David to tell him so, but he was further ahead than his hearing distance so I just stood to wait for him to notice I wasn’t with him. The next thing I heard was a thud and I knew it was my camera case that he was carrying hitting rock. I was so scared! I absolutely knew that David had fallen, and had visions of him hurting himself of the rocks and then shooting out of one of these ‘windows’ and landing in the ocean. Not a thing I could do to see what had happened, where he was, or if he was alright!!! In that instant I felt so angry with him for getting so far ahead and not noticing that I wasn’t with him but I could only hold my breath and strain my ears, and a split second later I think someone had asked “Are you OK?” and I heard David reply that he was. Oh my goodness!!! He came back within a minute or 2 and assured me that he had only got a very small cut on one finger. Moving right along from those very unpleasant imaginings, this felt like a fun view once we were both reunited. Once we’d safely climbed down and crossed the beach a man asked me to take a photo of himself and his lady – he’d got the exact same camera as me so he returned the favour for us! It’s funny the way we humans are drawn together by such small similarities. As we were being pushed and shoved to get back onto the long boats to go back to our cruising boat, the guide came up to us. It seemed she’d been speaking to all the Westerners, and here’s what she had to say. ‘You people must not be slow to get to the food when we get back to the boat. Asian people are not like Westerners and they will not stand back to let everyone have a share. You must get to the front of the queue or they will eat all the food and there will be nothing left for you. No food!’ Wow!!! We were last aboard the last long boat so it was already too late to tell us this. We got back to find that there was a queue and we were near the end. The Chinese girl behind me made it her duty to interfere with my rear end as much as possible to help the time pass before she could get to the table. Even as we approached the table she beat me and the 2 people in front of me to get a plate and cutlery!!! Half way along I said to David “I keep getting my rear end messed with!”, never dreaming she would understand me, but she hastened a “Sorry, sorry!” and continued without any change in her behaviour at all. The Chinese were now at the downstairs tables and their plates were truly mounded up to overflowing. No consideration for others at all, and the worst of it was that the ‘finished’ plates were still half full. What a dreadful waste, to say nothing of the greed and selfishness. Our next stop was probably the highlight of the cruise for us, and felt like the moment where the overbearing sense of disappointment in the holiday finally lifted. 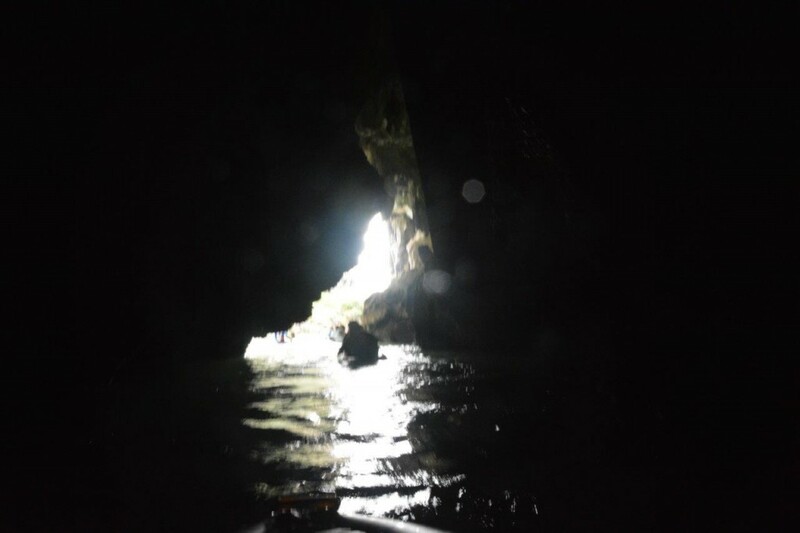 We had stopped quite near to a cliff face and there were a huge number of zodiac canoes coming out to meet us. We happened to be quite near to the back of the boat at the time so for once we weren’t far from the beginning of the que… I mean shove-and-scramble. And we held our ground too! 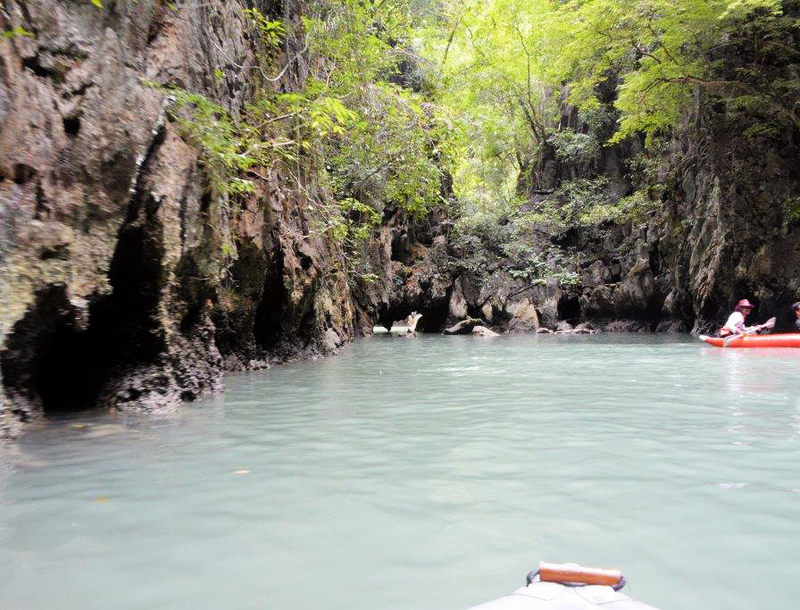 We got in and were soon paddling towards the cliff face, and then straight on in!!! 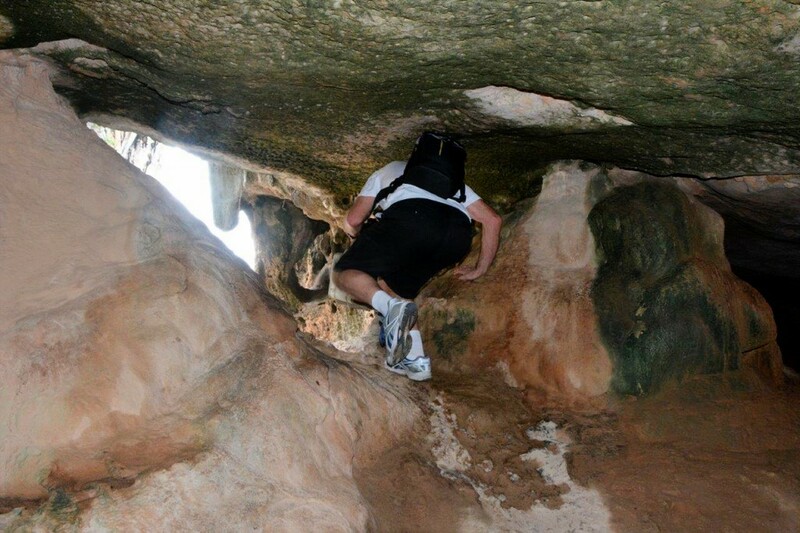 In places we had to lean far back to avoid the dark rock so close above our heads, but soon there was daylight ahead. As we emerged into the bright sun once more it was the most amazing and beautiful sight. 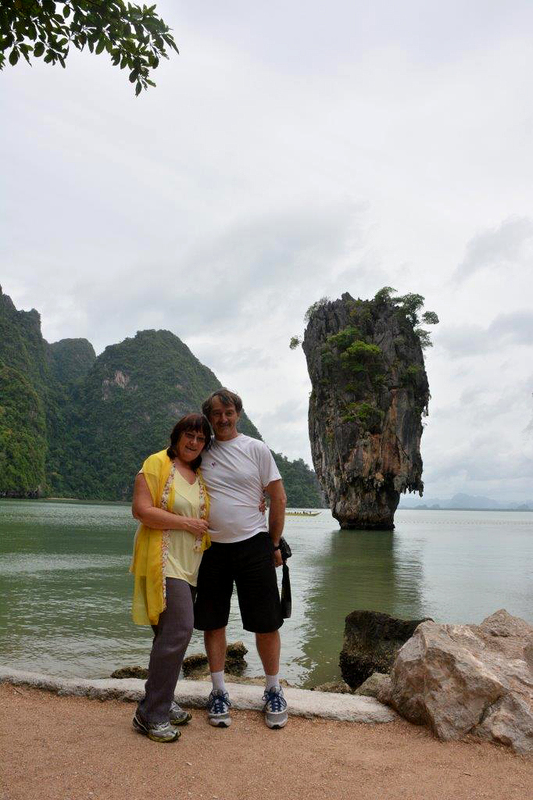 We were in a circlular ‘lake’ in the very centre of this island rock! 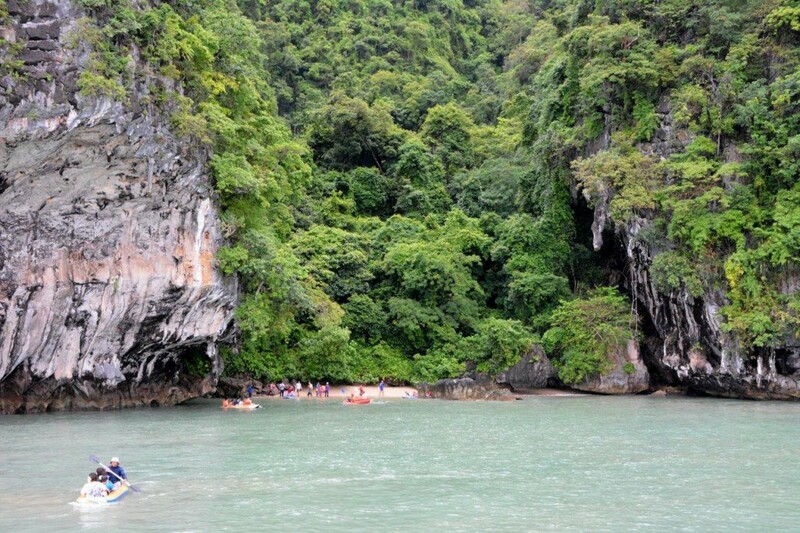 Sheer cliff faces covered in lush green trees and creepers towered above us. We both said “Oh WOW!! !” and just drank in the beauty, managing to ignore the other 10 canoes around us. Almost dead centre in the photo below you can see the tiny daylight windows peeking where we needed to go to get out again. The visit in here was far too short. I could easily have sat there in total peace for an hour and not been bored. The only thing I wished for was a fisheye camera lens to be able to take a photo of the entire scene! I believe these enclosed ‘lakes’ are named hongs. 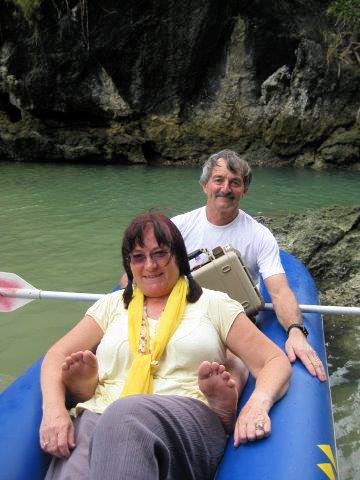 Our very lovely paddler took this photo for us. And I grabbed a shot of his beautiful smile too! 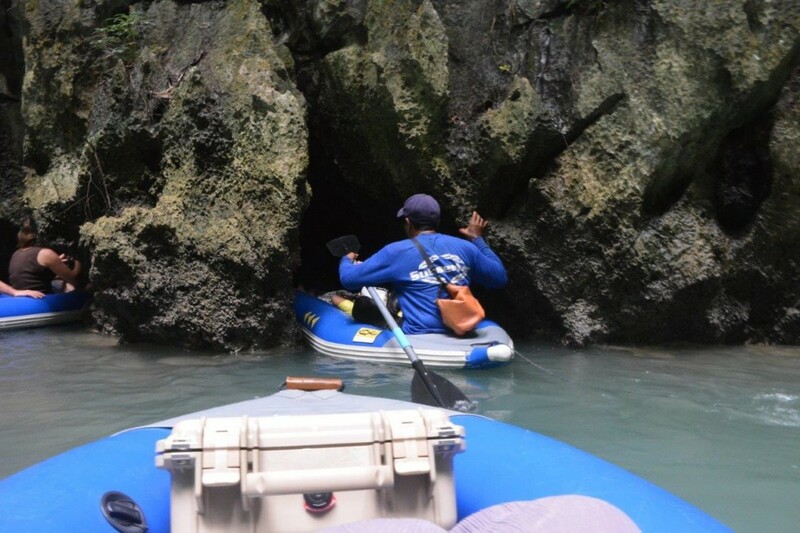 Just as we got out from under the island and were heading to our boat, one of the canoeists was pointing to the right. We looked too and there was a black wall of cloud and heavy rain coming towards us. David asked “Is that bad?” and the paddler replied “Very bad!” and started to paddle like crazy for the boat. 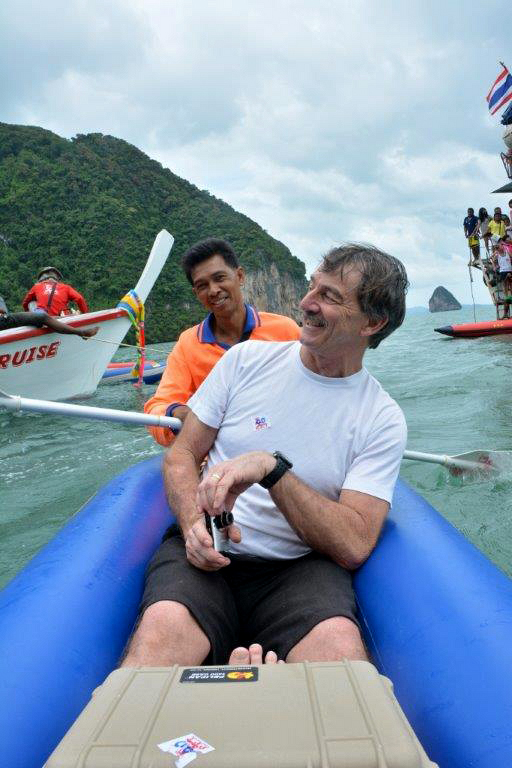 There were about 15 canoes all vying for position to allow the passengers to climb back onto our boat but, somehow, our man pushed them all out of the way and we were being helped back on board in a matter of moments. He had been incredibly kind because all of those people who got back onto the boat after us may as well have swum from the island – they were *drenched*!!! The canoes and paddlers were all hauled aboard as well and we sat there for a while with torrential rain hitting the clear plastic blinds that had been pulled down around the top deck area. It stopped again about 15 minutes later but you can see how wet the air was from this shot. The crew put some fresh fruit out – sweet bananas and pineapple, which was very nice, and the Chinese passengers must still have been full from lunch because there was plenty still as David went back for seconds, and thirds. 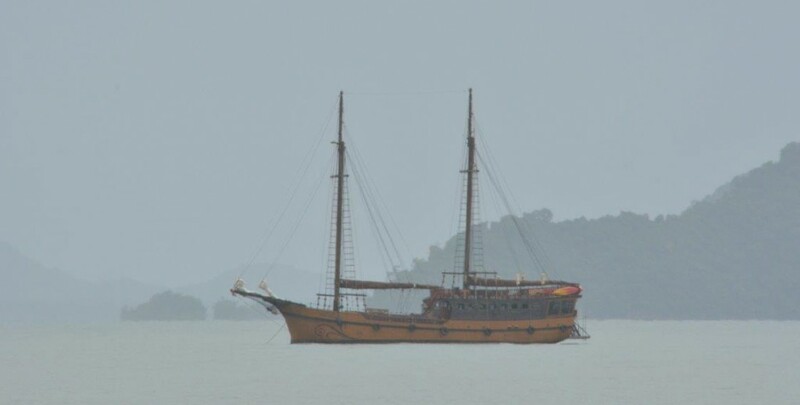 The next island, Hong Island, we decided not to do. It was only a few minutes since we’d got back on the boat and apparently it was another ‘island middle’ such as we had just seen. I suppose we really should have gone, but the rush to escape the rain had unnerved me a little, so instead of that we took photos of the cloud above some nearby islands that appeared to be volcanoes erupting. Which wouldn’t have 100% surprised me, but I was trying to be positive. We were stopping here so that people could have a swim. David was going to stay on the boat but we’d only done 2 of the activities and it would feel very wasteful to only do 2 of the 4 for the day. So we piled into a canoe and got a lift to the shore. I just pottered around and took some unthrilling photos while David did actually have a swim. Some people had elected to swim from the boat to the shore but one guy will never do that again. Suddenly he was yelling for help between going down under the water. Several of our canoes leapt into action and soon had him clinging for his life to the pointy end of one of them as they paddled him in to shore. It was rather a horrible thing to witness, but of course we were all hugely relieved that he was OK.
And that was it pretty much. 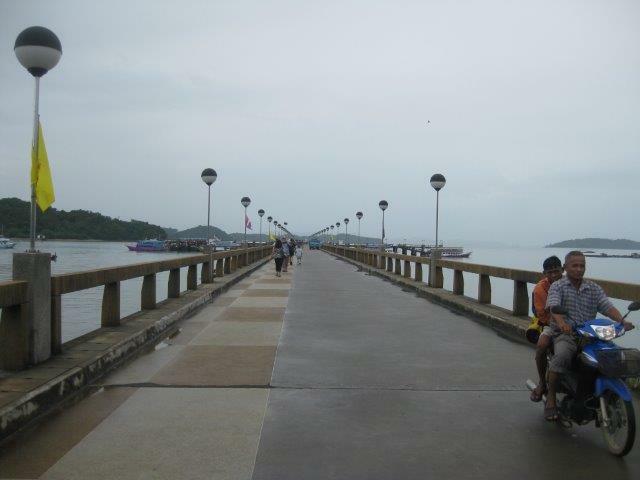 Back to the port, walk to the buses and we were driven back to our resort. After we got back we had a nice shower to get the salt air out of our hair and elected for dinner in the resort restaurant. We had garlic bread (oh how I *love* garlic bread!) and it was really nice! David had grilled chicken with potato and salad. The ‘salad’ was 2 square inches of lettuce with a single slice of cucumber and a single circle of carrot on it – we giggled! I had fish and chips, after which we had a wonderful and leisurely chat and drinks with Sheryl and Jon. We followed this with a cuppa while we researched what we wanted to do the next day, and then fell into bed.